OSV Newsweekly serves Catholics at all stages of life as they walk the road of faith. Through thoughtful analysis, faith-filled commentary and inspiring stories, we provide clear answers to the questions people are asking. OSV Newsweekly speaks the truth in a way that seeks unity in our increasingly polarized world. 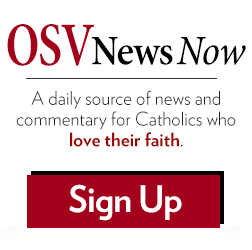 A trusted publication for more than a century, OSV Newsweekly is an indispensable source of information and formation for Catholics who love their faith. OSV Newsweekly, under the name of Our Sunday Visitor, was founded in 1912 by Father John Francis Noll, and it continues to publish 52 times a year. Gretchen R. Crowe is editor-in-chief of OSV Newsweekly, where she oversees the publication of the only national Catholic weekly newspaper in the United States. She also oversees editorial content and design of Our Sunday Visitor’s The Priest and Deacon Digest magazines, Radiant and Valiant magazines, and SimplyCatholic.com. An award-winning writer and photographer, Crowe has been a member of the Catholic Press Association since 2005. She joined Our Sunday Visitor in March 2013 as OSV Newsweekly editor. She published her first book, “Why the Rosary, Why Now?” in May 2017. Crowe is married to her husband, Michael Heinlein, and the couple is expecting their second child in May 2019. (800) 888-430-7512 between 9:00 a.m. – 5:00 p.m. (E.T.) Monday through Friday.